I was born in a lighthouse on a peninsula in Michigan. Our light guarded the entrance to Bay De Noc, a thumb of water jutting out from the main body of Lake Michigan north of Green Bay. A lighthouse on a fresh-water sea is a wonderful place for a little girl, and it was especially exciting during the period sometimes called the Gay Nineties. Some of my happiest and proudest moments were spent with my father, taking loving care of the big light. We had to light the kerosene burner, polish the magnifying lenses, apply glycerine to the outer glass panes to keep frost from clouding them, and we had to polish endless acres of brass, even to the dust pans and small utensils. Everything had to be painted with governmental regularity and kept forever clean and shipshape. Through all of the repetitive housekeeping tasks we felt that it was all worth while as long as the big light was up there to do its job. I can remember watching my father light the kerosene lamp, carry it up the winding iron stairs to the top of the forty-foot white brick tower, place it in position, and send its beam out over the lake. There was something fine about the way the big light reassured and guided the long, lean iron ore ships around the point and into the harbor of Escanaba. Nature has her violent moods in Escanaba, and out on the peninsula we felt them without the cushioning effect of buildings or trees. Storms piled ice floes in big piles thirty feet high, temperatures went down to forty below zero, and ice thick enough to drive wagons on covered the bay. That was the Upper Peninsula winter. Summers were different. We had our own beach, with white sand and cool, clear breezes. People came from as far away as Chicago to spend their summers along our lake, where their doctors told them they could escape asthma and hay fever. Troupes of actors rehearsed on our shore near the lighthouse, and the famous Winninger brothers were among them. Indians came across the bay in their strange boats with the high ends, bringing blueberries to sell in town. They always camped on the beach. My father would never let them build a fire at night, for fear the blaze would confuse mariners, but when morning came he let them build their fires. Summer brought some of nature's violence, too. One day when I was up in the tower [age 18], lightning struck the light. I don't remember how I did it, but I found my way outside after going down the winding iron steps while in a state of shock. My brother was temporarily deafened by the bolt, but I was not injured. I must admit that I acquired a dislike for lightning. As an adjunct to the lighthouse, we had a fogbell in its own little building. As the violent lake storms built up the point on one side and ground it away on the other, we had to have the little structure moved several times. I wonder where the fog warning is tonight, and I wonder if the lake has claimed the white brick lighthouse. In fact, the fog warnings now are automatic; and the white brick lighthouse is a museum and a registered National Historic Place. 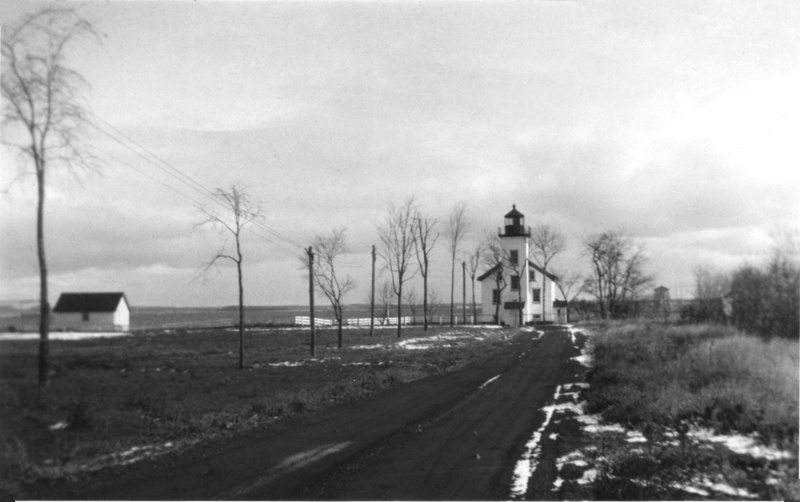 Terry Pepper provides the best online material on the Sand Point Lighthouse: detailed history and description, and a variety of excellent pictures. Here is the National Park Service's official listing of the lighthouse. 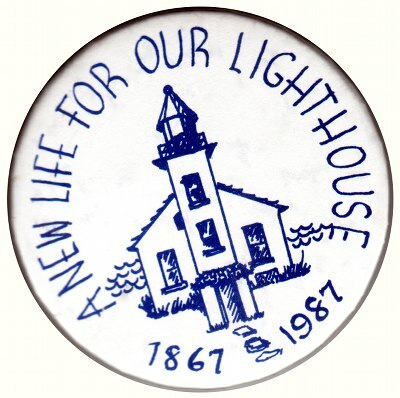 Additionally, there are Sand Point Light interior views online. You can see close-ups of the tower as well as the lantern and lens. All these sites provide some description and history. Thanks to the Delta County Historical Society for restoring this fine building. 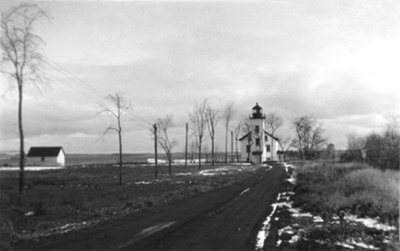 For more of my mother's personal story, see Lightning Strikes the Lighthouse: Sand Point, Michigan, 1906 by Wilfred R. Franson.